As the weather begins to cool down and the wind picks up, I find that my skin becomes drier. I'm usually not one for skin care, but during the winter it becomes more necessary to moisturize and take care of your skin. Estee Lauder always has great skincare products and has a glowing reputation for it. I personally don't use the advanced night repair serum, but I know a few people that swear by it. It makes your skin softer and smoother overnight. Exfoliating your skin is so important. 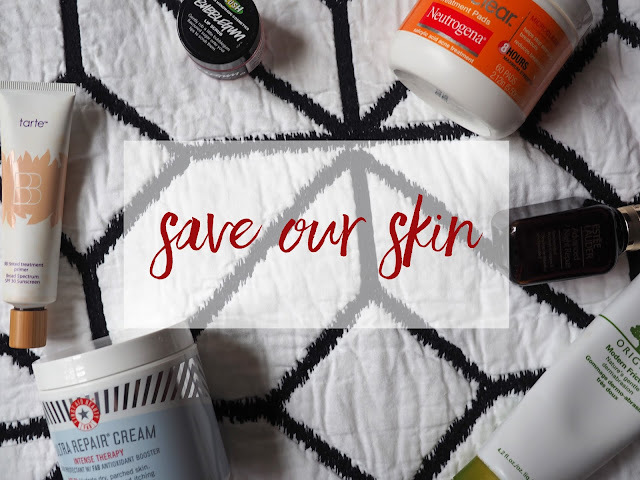 Obviously, moisturizing your skin is the main mode of saving your skin and the most effective, but exfoliating your skin is pretty important as well. Exfoliating can reveal a softer and smoother face which you can then maintain with regular moisturizing. I don't exfoliate that often, but the best way to do this is by using it every week, The one I use is from Origins. As previously mentioned, moisturizing is the number one way to save your skin! I've tried out many face creams and lotions in order to find the right one, (the Estee Lauder night cream worked well for me, but it's more meant for older people and not people as young as me.) I'm currently using the First Aid Beauty ultra repair cream which is meant to not only moisturize, but to also soothe irritation. I've read many glowing reviews on this product, many saying that it helped clear their acne and hydrate their skin, so I thought I'd give it a try. If you want to take caring for your skin even further, try using a BB cream. Why? BB creams usually have SPF along with them, that can protect your skin. The one I have from Tarte has SPF 30. Don't be fooled by a cloudy day, your skin can still be impacted all year round. Sure, you may not get a sunburn, but it's important to protect yourself from further skin damage. Using a BB cream doesn't take much effort, especially if you already use a foundation everyday, and it never hurts to take the extra precaution. Lips still count as skin, right? It's important to not only exfoliate your face, but also your lips! Lush has the best lip scrubs with incredible scents, the classic lush lip scrub flavor is bubblegum, the scent is sweet and sugary. A scrub keeps your lips smooth and soft, just like what an exfoliate does for your skin. If you have acne, Neutrogena has the best products for that. I don't really have many issues with acne, cross my fingers that I don't have any in the future, but a great product for it is the Neutrogena rapid clear treatment pads. All you have to do is swipe them on your face and then it will help to prevent any acne from appearing or treat any current acne. Note that most acne products dry out the skin, so it's especially important to moisturize along with it.